A field day was held on September 14, 2004 at Morning Glory Farm. Twenty-five local producers, potential specialty crops growers and Master Gardeners participated in a Field Day at Morning Glory Farm on September 14, 2004 from 9:00 to 12:00 Noon. Participants had the opportunity to look at the on-farm trail, ask questions, and visit other sites of interest at the farm. 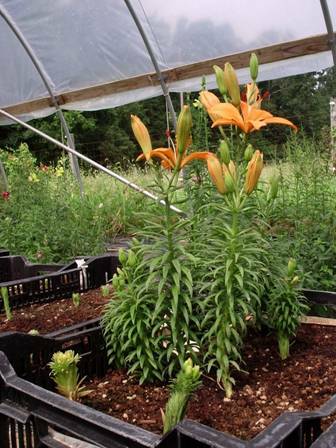 Test Trial: Our research was designed to determine if Asiatic Lilies would grow during the summer months in North Carolina under partially controlled conditions in a hoop house. We tested five varieties of bulbs over a 14-week period. The bulbs need to be cool until they emerge. To accomplish this the bulbs were placed in a cooler at 45 degrees until planted. Both the hoop house and the crates were covered with 50 percent shade cloth. Lilies are sensitive to fluoride which comes in chemical phosphate fertilizer. You should also not use a mix with too much perlite. We used ½ peat moss and ½ Farfard 2 mix (low perlite). Because lilies also need calcium we added milk powder. Too much moisture causes Botrytis. Bulbs were watered by overhead mist, but checked daily. A 24 inch greenhouse fan provided air circulation. Sides and back of the hoophouse were open. We found the crop a disappointment for the 2004 summer season. Contrary to the information provided from the company, we believe the 93 degree plus heat in early June just after the bulbs were planted was the largest factor in the slow emergence and the stunted growth of the bulbs. Also, we believe we should have dripped the bulbs instead of overhead watering to ensure more thorough, but less daily watering. Since we believe lilies may be better as a spring crop, we will try the bulbs again in crates, beginning in February and throughout the spring, but no later than May 15th. June 10 Temperature rises to mid-90’s, watered with sprinklers 4 times a day for 15 minutes. Checked daily to make sure they were not drying out. 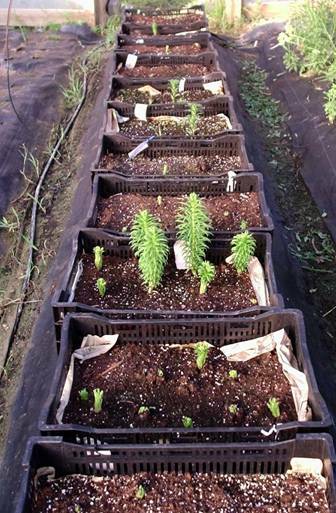 June 20 Took shade cloth off crates since first bulbs were at the top, still only a few emerging. July 5 Concerned with slow emergence, not growing very fast. Fertilized with composed chicken manure (Black Hen/2-3-2) and watered with Omega (6-6-6), a compost tea. All bulbs should have emerged, but only about 60 percent had emerged by this date. July 26 First two buds, but plants only about 18-20 inches tall. Remainder of the bulbs continue to bud off and on through July and August, but total budding only about 30 percent of those planted and all but a few, very short.